Carry ETFs are a way to participate in a Borrow Low – Deposit High program. We have been covering Borrow Low – Deposit High ideas for over 30 years… clear back into the 1970s long before this became a fashionable idea. The power of the idea remains but in some ways it has become harder to do. In other ways, it is easier to Borrow Low and Deposit High. The idea is really simple. Most currencies rise and fall in their parity versus other currencies. As they rise, their interest rate tends to fall. When weak their interest rate, tends to rise. Markets rarely judge and value the interest rate relationships correctly. They tend to overvalue strong currencies and undervalue weak ones. The goal in the Borrow Low principle is to borrow low interest, strong currencies that should not be so strong and invest the loan in high interest, weak currencies that should not be so weak. The profit in this process is carry… the difference earned between the loan cost and the interest earned. Also eventually currency fundamentals overrule market sentiment, and the weak currency strengthens versus the strong as well so there is a forex profit to boot. Take for example the US dollar versus the Brazilian real. 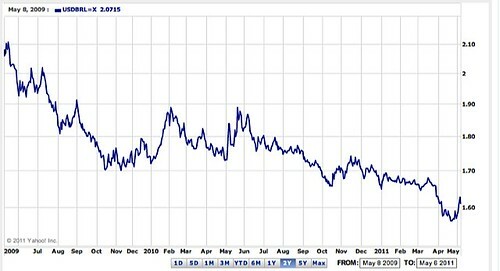 Two years ago, June 11, 2009 this site review the benefits of investing in Brazilian bonds paying 10% in a message entitled Brazilian Opportunity. I borrowed US dollars at 3% interest and bought Brazilian bonds myself. Thus for the past two years I have been paid 3% on these loans. Look at what has happened to the US dollar compared to the real! This chart from www.finance.yahoo.com shows that the dollar has fallen from 2.10 real per dollar to 1.60 real per dollar a forex appreciation of almost 25%. We’ll update our Borrow Low positions at our June 24 to 26 International Investing & Business Seminar in West Jefferson, North Carolina as we look at investing and business ideas for the quarter ahead. See details here. Regretfully money laundering, anti terrorism and anti tax evasion regulations have made it harder and more expensive to bank anywhere…. but especially it has become more difficult to bank where one is not resident. US investors have a tough time banking in Europe and Europeans find it much more complicated to open US accounts. There are numerous reasons for this but the bottom line is that bankers have to spend more time knowing their clients and staying in compliance with their own laws and international laws dictated by treaty. Time provided by highly qualified, well trained personnel is expensive so bankers have been forced to find ways to increase revenues. One of the most obvious income producers for investment banks are higher fees… and/or higher minimum account size so investors with less than $100,000 to set aside find it hard to open investment bank accounts abroad. One way to overcome this problem is with Jyske Global Asset Management, who offer both Borrow Low – Deposit High Equity Bond managed accounts and Borrow Low – Deposit High managed forex accounts. Another way to participate in Borrow Low – Deposit High is with Currency ETFS and Borrow Low – Deposit High ETFs. ETFs offer a Borrow Low-Deposit High investment with great diversity. Some ETFs take both long and short positions in up to a dozen currencies. This makes this leveraged investment technique available to almost every investor. For those who want to Borrow Low-Deposit High with an ETF, the PowerShares G-10 Currency Harvest Fund (DBV) borrows the 3 lowest yielding currencies and invests in the 3 highest yielding currencies. DBV tracks the Deutsche Bank G10 Currency Future Harvest Index, a benchmark composed of currency futures contracts on certain G10 currencies that is designed to exploit the trend that currencies associated with relatively high interest rates, on average, tend to rise in value relative to currencies associated with relatively low interest rates and invests in the G10 currencies (which include the U.S. dollar, euro, Japanese yen, Canadian dollar, Swiss franc, British pound sterling, Australian dollar, New Zealand dollar, Norwegian krone and Swedish krona). 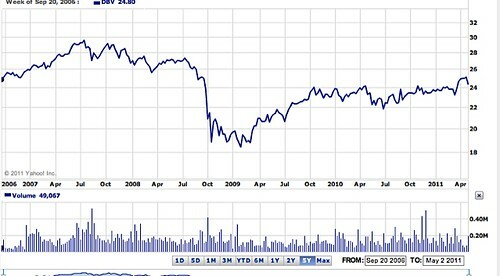 This fund has performed nicely, up about 10% per annum over the past two years as this chart from finance.yahoo.com shows. A Businessweek.com said of this fund in an article entitled “Trade Currencies Like A Hedge Fund” – A new ETF allows you to profit from the disparities between national interest rates: Seeing the words “currency” and “hedge fund” together might cause investors who remember the financial crises of the late 1990s to raise their eyebrows. The collapse of the Thai baht in 1997 and the Russian ruble in 1998 triggered massive hedge fund losses that cost investors billions. Now, through adroit financial engineering, Deutsche Bank (DB ) and PowerShares Capital Management have come up with an exchange-traded fund that replicates a hedge fund strategy known as the “carry trade” used in currency markets. The returns, which are just hypothetical, also showed that the index had less than half the volatility of the S&P 500. What’s more, the carry trade’s returns had almost no correlation with stocks, meaning the ETF should be an excellent portfolio diversifier. Still wary? Unlike Long-Term Capital Management, the once-stellar hedge fund that invested in currencies and collapsed in 1998, this ETF invests only in the currencies of developed nations with high credit ratings. There’s no leverage, either—a big factor in LTCM’s implosion. At the time of the article the yen accounted for one-third of the short position, as did the Swiss franc and the Swedish krona. The New Zealand, Australian, and U.S. dollars were on the long side. Interest rates in Japan were very low at just 0.5% and those in New Zealand at 7.6%, the spread between the highest and lowest rate countries was still wide. The article warned that a stronger yen or a weaker greenback could spoil the play which in fact it did as you can see from this five year chart of this ETF. 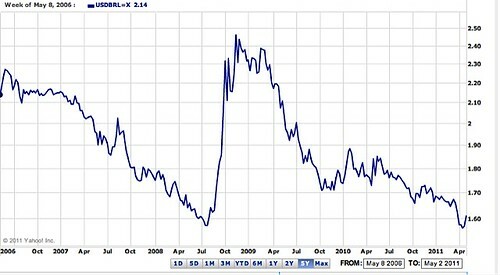 October 2009 was a very bad time for those betting against the US dollar! the borrow low tactic is not without risk. The July 2009 strengthening of the US wiped out short term Brazilian real speculators who were over leveraged, underfunded or who panicked, though long term the idea (borrow dollars and invest in real) has been very good. This ETF would appear to have two safety features… no leverage and investments only currencies of mature economies though the leverage reduces profit potential and some would argue that mature economies are now riskier than emerging. Nevertheless this ETF offers a way for almost anyone, even with small savings to invest in a multi currency tactic that diversifies in a spread of currencies and takes advantage of shorting (borrowing) currencies with low interest rates. Our recent message Inflation and a Falling US Dollar listed Morgan Hatfield at Ruggie Wealth Management/RW Direct as a source of information on several global ETFS as well. As inflation takes its bite, we need to adjust our investing and business to protect our purchasing power. Professional managers playing the “carry trade” will pay particularly close attention to inflation fighting currency ideas. We as individual investors should pay attention as well and diversify into appreciating currencies and out of those on the fall. See how to get our regular multi currency portfolio updates. Learn how to combat inflation with Ecuador real estate. Meet Gary Scott and Thomas Fischer from Jyske Global Asset Management to learn their most current Ecuador and multi currency investment ideas at the June 24-26 International Investing and Business Seminar in North Carolina. One reason for the carry trade’s success is that Japanese interest rates have hovered near zero for years because of a weak economy. That has enabled hedge funds to short the yen and go long on currencies from countries with healthier economies and higher interest rates. Here’s how it works: An investor buys the currencies of countries with high interest rates while selling short those with low rates. The return comes from both interest income and the expected strengthening of the high-rate currencies and the weakening of the low-rate ones. The ETF’s benchmark is the Deutsche Bank G10 Currency Future Harvest Index. Although the carry trade is an old strategy, the index was created for the ETF and a Deutsche Bank back-test of the index generated noteworthy returns: an 11.4% annualized average over 10 years compared with 8.2% for the Standard & Poor’s 500-stock index.